Rishita Infratech the New Era of Real Estate in Lucknow. At Rishita , we’ve got your ambitions in our sights. As industry leaders, we have the expertise and know-how to innovate and create dynamic, customized business solutions for our clients. And through our world-class teams’ market expertise and vision, we’ve continued to be trailblazers within the residential real estate industry. We’re the perfect combination of corporate and close-knit. And our employee culture is just as rich as our market insight. We focus on opportunity: we want our employees to tap into their inner entrepreneur and express their creativity to create exciting, fresh business solutions. Every day at Rishita brings new business challenges and takes your career further. We want to help you develop your strengths. And we embrace diverse perspectives, encourage career growth and reward great work. We’ve grown from humble beginnings to become one of the India’s largest and most respected residential real estate and investment firms. Rishita Infratech was established with the progressive thought and focused vision in 2017. Since its inception, With the passion for creating vibrant and sustainable communities, RI, aims to develop not just homes, but a valuable legacy. It aims to develop dream homes that are pocket-friendly and create spaces where life meets lifestyle. As for RI, the design of a home doesn’t stop at the door. Rishita Infratech has continually pioneered newer technologies, bold design and precision engineering to create landmark residential townships. Propelled by the drive to change expectations and the lifestyle of people thus changing the trend of skyline in the city, Rishita Infratech has ushered in an era marked by higher standards of living and global lifestyles. Rishita Infratech is growing today as leading real estate group with its flagship business in Lucknow. 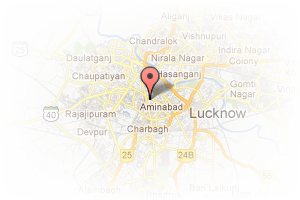 Address: Asia Management college, Kursi Road, Lucknow, Uttar Pradesh, India. This Broker Profile page for "Rishita Infratech Pvt Ltd" has been created by PropertyWala.com. 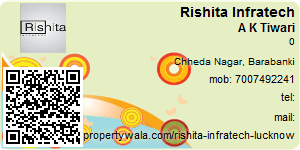 "Rishita Infratech Pvt Ltd" is not endorsed by or affiliated with PropertyWala.com. For questions regarding Broker Profiles on PropertyWala.com please contact us.